Li Keqiang’s visit suggests that the U.K. needs a new model for conceptualizing its relationship with China. If the stories are true that the Chinese government threatened to cancel Premier Li Keqiang’s visit to the U.K. in June unless he was granted an audience with the British Queen, and that there were formal complaints from China about the length of the red carpet from Li’s arriving plane to the airport terminal, then we have truly reached an era when diplomacy has become an extension of the entertainment sector. At a time when China’s foreign policy is becoming increasingly schizophrenic, the U.K. sits at the forefront, managing to bring out the worst political mood of the Chinese while still delivering positive economic results. London forges ahead as a finance center for China; Chinese state and non-state companies buy more assets in Britain than anywhere else in Europe. Exports are rising, and the U.K. continues to be a good place for Chinese to study. The most impactful result of Li’s visit may well prove to be the moves to liberalize the visa restrictions the U.K. places on Chinese tourists and business people. An uncharitable interpretation of Li’s apparent keenness to see the U.K.’s largely politically powerless monarch might view the meeting simply as a dig at the U.K.’s continuing love of pompous symbolism when it has now shrunk in importance in most Chinese eyes. If ever there was a case of accelerated asymmetry, China and the U.K. exemplify this. Three decades ago, the British Foreign Office’s finest Sinologists haggled imperiously with their Chinese counterparts over the fate of Hong Kong. Today, the deals they put together seem to be crumbling into dust. Many in Hong Kong are starting to realize more than ever before that they have to sort out their own fate. Li’s visit proves there are niche areas where the U.K. matters to China. But there is little appetite in China for allowing the U.K. to clamber up onto the moral high ground and deliver ponderous lectures on the world order, how to manage the Middle East or anything else. Today, the relationship is all about brutally pragmatic give-and-take. Li was pictured shaking the Queen’s hand, but he might just as well have been symbolically bidding the colonial U.K. and its history goodbye. It was a piece of diplomatic theater, upending the normal historic template. For the U.K., the issue is how to shape a wholly new narrative, one that offers a revised mode of engagement with China free from the weight of this clunky symbolism and history. There are important differences over political and social values, but China’s ability to determine the U.K.’s own economic prosperity necessarily impacts how these issues are spoken about. How does the U.K. address both realms without sounding incoherent or hypocritical? The U.K. simply needs to forget some of its grand history, and jettison a lot of the past in this new era of harsh pragmatism. In that sense, Li’s visit served a very useful function indeed. The U.K. should be grateful. 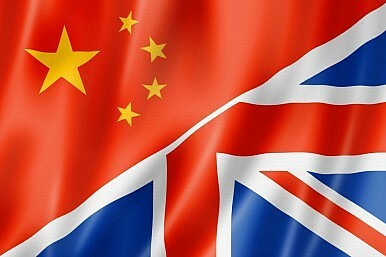 It will take more imagination and more passion to unlock the potential of U.K.-China relations.